The Francis L. Castleman building rests along one edge of the quad on the University of Connecticut’s Storrs campus. It’s marked out by its central stone façade and curved staircases. 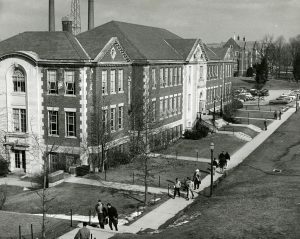 Originally called Engineering I, the building was officially completed in 1941 (though it opened for partial use the year before). 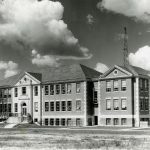 It was constructed during a major period of campus renovation carried out by the Works Progress Administration in the late 1930s-early 1940s under the direction of President Albert N. Jorgensen (whose presidency from 1935 to 1962). 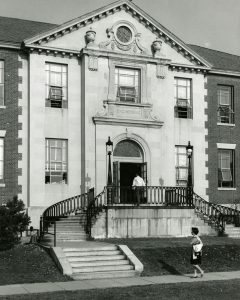 In 1970, the building was renamed after Francis Lee Castleman, Jr., a noted professor of civil engineering at UConn. Castleman was born in Trenton, New Jersey, in 1902. 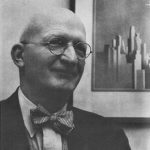 He received an undergraduate degree in civil engineering from Lehigh University in 1925 and received the John B. Carson prize for distinguished work there. He later pursued graduate study at the University of Pennsylvania, receiving his doctorate in 1935. After completing his studies, Castleman designed bridges for the well-known American Bridge Company, formed out of a merger of twenty steel companies in 1900 by J. P. Morgan & Company. He also served as a professor of structural engineering at Vanderbilt University before coming to UConn in 1942. At UConn, Castleman was appointed professor of civil engineering and named chair of the department. He was then named Dean of the School of Engineering just a few years later in 1946. He was a member of several professional organizations and published widely on topics involving structure and mathematics. In addition to his teaching and administrative duties, Castleman was active in and around Storrs. He served as a faculty adviser to UConn’s Engineers’ Club and on the Connecticut State Building Code Commission. Castleman died on December 30, 1955. The Castleman Building continues to house offices for the Dean of the School of Engineering, as well as classrooms, laboratories, and faculty offices for the Department of Civil and Environmental Engineering. It remains one of the older buildings on campus, though it underwent significant renovation in the 1990s.